Happy Tuesday! Can you believe that this is the last week in January? Where did the time go?! This week’s Tuesday Topic: How do you deal with stinky running clothes? You can write about this topic, or feel free to post any running related blog post. Remember to Link-up with Kim and Zenaida and the bottom of this post! While I love to run, what I don’t love is dealing with stinky, sweaty running clothes. Unfortunately I can just look at the sun and start sweating so I am usually sweating buckets when I run during the “warm weather” months (not so much in the Winter). I’ve been using the same method for washing my running clothes for the past 2 years and it’s worked well. I’m happy to share those tips with you today! I have a separate laundry bag for my running/workout clothes. 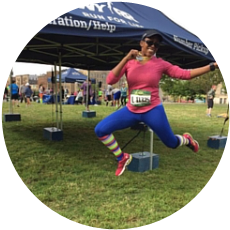 No need to funk up the rest of your “regular” clothing by mixing them with your running clothes! In addition to keeping them in a different bag, I also try to do laundry once a week. I feel like the longer you let the clothes sit, the more likely the smell will get embedded into the clothing. Also, I use a different detergent for my running clothes, so it just makes sense to keep it separate. While you can certainly use regular detergent, I have found that using detergent specifically for workout gear is the best. My top 2 brands are Vapor Fresh and WIN. With these detergents I only have to wash a load of workout gear once. Sometimes with regular detergent I would have to wash the load of clothing twice. I always air dry my running clothes on drying racks. Not only can the dryer shrink your clothes, but it can ruin the sweat wicking material of the clothing. Also it can trap in any remaining smell as well. I also like to air dry my clothes because it helps them to maintain their shape as well. Tell me: How do you clean your running clothes? Do you use special detergent or a natural cleaning remedy? Topic for next week – What are your favorite non-running products? We hope you’ll link up with us! I always air dry my running clothes, but I don’t use a special detergent. So far so good! I think the air drying is so important! Sport specific detergent is what’s worked for me, too! I love WIN! i had a lot of success with WIN too! I am so bad about this. I throw everything in the machine together and then in the dryer to.. So far so good. If it’s working for you then that’s great! I don’t use a special detergent or keep my running clothes separate. But I do air dry my Skirt Sports. And I sweat even in winter! I’m probably overdressed, but it just get so chilled when I’m done — cause I sweat! It’s a catch-22. Then again, I’ve always been a heavy sweater. That’s true. Sometimes after a long run in the summer, I’ll throw my clothing in the shower with me to rinse then out, air dry them and then put them in the hamper. I air dry most of my workout clothes, too. It helps them last so much longer! Totally agree! I’ve had some running items for 5+ years! Really great tips. I honestly never thought to store my workout clothes in a separate hamper…I definitely need to start doing that! And clearly, I need to get on air drying! Yes! The air drying is probably more important that the detergent. I think it’s why my running clothes have lasted so long. I have a pretty similar routine, but I add one step ahead of the washing part… 🙂 I am intrigued by the detergent. I have one that I like, but I am willing to try different ones 🙂 Thanks for the recommendation. No problem! If you try it out and like it, let me know. I do that too – especially in the summer. If not, the smell is horrible! Thanks for linking up with us and loved your RunBet review! I have not seen either of those detergents around here (you know, in Mayberry LOL). Knock wood, my clothes seem to do alright with regular detergent. I always hang them up to air dry (right after a workout) so they don’t get mixed in with my regular clothes. I always air dry them after washing as well. I think that the air drying is most important. It’s probably the reason why my running clothes have held up for so long! I’m afraid I do everything wrong. I throw all my clothes together (though they are all mostly running or fitness gear since I work it that type of clothing too), I usually use regular detergent (though I love WIN, I’m just out of it right now), and I wash everything together. Oh, and I toss it in the dryer, though I do turn down the heat. It all seems good though some of my older running clothes tend to get a bit stinky when I sweat. Hey, it’s worked for you so far so I say keep doing it! I haven’t heard of Vapor Fresh before. I do love Win detergent but have to admit I often just toss everything in together. I tried WIN a few years ago and really loved it! Good to know! I normally dry my running clothes but maybe I should re-think that now. I think air drying helps them keep their shape and last longer – give it a try! I think you and I have the same drying rack! 🙂 I am afraid of drying my clothes in the machine for fear that they’ll be ruined. I think we do! Great minds think alike lol. I started using a special enzyme-based detergent for my running clothes. Shirts and bras that had been stinky for years are now totally wearable again. It is amazing! My clothes generally go straight in the washing machine, especially in summer. I don’t use a special detergent (although sometimes I will get the Sports geared Tide pods). Everything gets air dried except for my socks. And if it starts REALLY stinking, that means it’s time to replace. My stuff rarely gets as bad as Mr PugRunner’s and now little man’s. We shall see how we do when summer rolls around again. Yeah the summer running definitely wreaks havoc on my workout clothes. I normally have to do a few smaller loads throughout the month. These are such great tips! I have tried the Win before and like it, I need to pick some more up. I had not heard of the Vapor Fresh, but I am going to look for it now!! Vapor Fresh is working well for me but I would definitely pick up WIN again once I run out of it.